Twenty-one years to implement HACC Inquiry recommendation. In 1994, Inner Voice reported on the House of Representatives Standing Committee on Community Affairs inquired into the Home and Community Care (HACC) Program recommending amongst other things, “Regional Community Assessment Agency to be independent of service providers and governments” which is “to conduct gatekeeping assessments in line with the eligibility criteria of the relevant programs. The agency would be accountable through normal Program channels“. And that individual service providers, “should retain responsibility for deciding on relative need, developing care plans for individual consumers, for ongoing monitoring of consumers and for reassessment and minor adjustments of service levels”. In early 2013 the Labor Government introduced significant reforms in the former HACC space with Living Longer, Living Better – now called Home Support. It introduced a single entry point into services via My Aged Care contact centre, a standardised assessment form and electronic referrals. The incoming Coalition Government was broadly in line with the Living Longer, Living Better reforms with the exception of face-to-face assessments. The aged sector, through the National Aged Care Alliance argued for (and was ultimately successful in gaining) regional face-to-face assessment services. These services known as Regional Assessment Services came online on 1 July 2015 with the mandate of assessing clients referred to them by the My Aged Care contact centre. So it seems that the Committee’s 1994 recommendations come to fruition some 21 years later with the creation of the Regional Assessment Services with the exception of being able to take referrals directly from service providers for assessment. The House or Representatives Inquiry into the Home and Community Care (HACC) programme presented its findings in the report Home But Not Alone in September. The following Is a brief summary of the major recommendations. 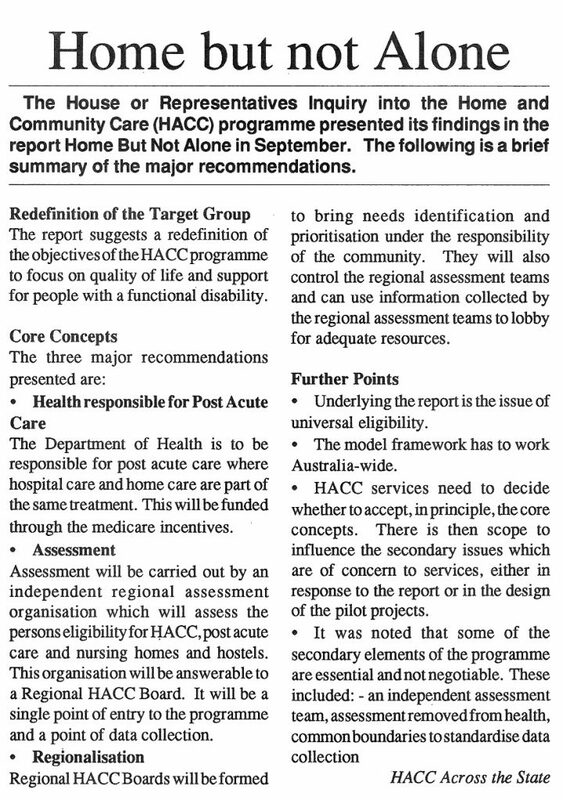 The report suggests a redefinition of the objectives of the HACC programme to focus on quality of life and support for people with a functional disability. The Department of Health is to be responsible for post acute care where hospital care and home care are part of the same treatment. This will be funded through the medicare incentives. Assessment will be carried out by an independent regional assessment organisation which will assess the persons eligibility for HACC, post acute care and nursing homes and hostels. This organisation will be answerable to a Regional HACC Board. It will be a single point of entry to the programme and a point of data collection. Regional HACC Boards will be formed to bring needs identification and prioritisation under the responsibility of the community. They will also control the regional assessment teams and can use information collected by the regional assessment teams to lobby for adequate resources. Underlying the report is the issue of universal eligibility. The model framework has to work Australia-wide. HACC services need to decide whether to accept, in principle, the core concepts. There is then scope to influence the secondary issues which are of concern to services, either in the report or in the design of the pilot projects.